We can say our garden never sleeps. Presently, garlic, herbs, onion and broccoli plants are growing. With the warm late winter temperatures, we already started harvesting broccoli and it’s only early March. We used the overwinter technique a.k.a “hibernation” with the help of a cold frame to grow broccoli during winter time. But for this past winter, that idea was not on the drawing board. Remember the ground hog attack on our broccoli plants last fall? 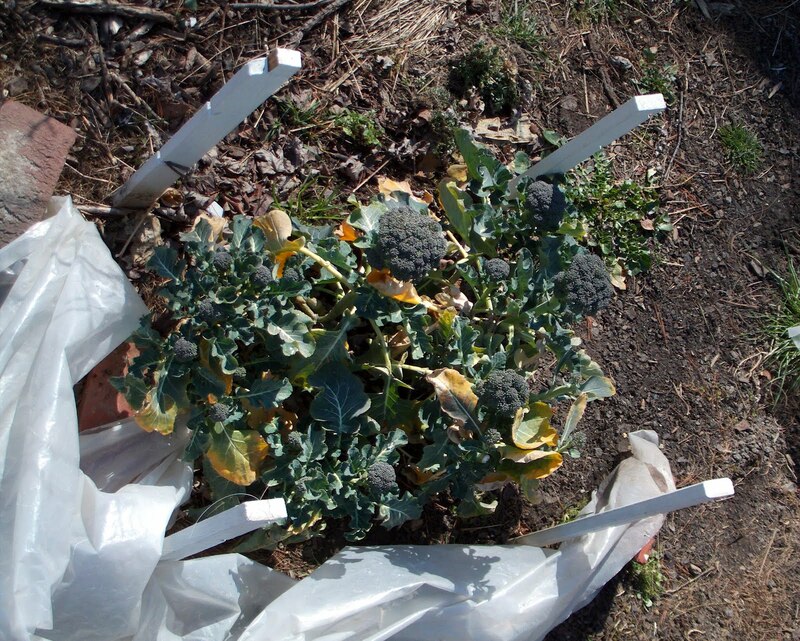 At our amazement, all broccoli plants survived, restarted to grow and grew nice, heads (about 1″ wide) by mid November. We started him from seed and transplanted this guy at its location in April 2010 [sic]. Yep, a two-year-old broccoli plant. You can also see the guy on a picture included in a post dated November 29, 2010. In that same picture, shown below, it’s the guy next to the green arrow on the left. The reason for its longevity? Being close to a blueberry plant with a regimented spray program surely helps. As does my wife’s inability to pull out vegetable plants ‘just in case’ they might produce something more. Nicolas, did you build the frames for the row covers yourself (2010 photo)? I don't even try to plant broccoli in my garden due to bugs, but this might protect them in the summer too. Thoughts? Thanks! Yep, I made the little greenhouse from 6 lengths of 1/2″ PVC tubing. It's about 2'x 4'. The 2 supports, show on the left are made from PVC leftover from another project. This technique shows in the last picture is called: double row cover and it's for cold winter. Last winter I only use the polyethylene sheeting.